Bhante Henepola Gunaratana is a Sri Lankan Buddhist monk. He is often affectionately known as Bhante G.
Bhante is a title which literally means something like reverend sir in Pāli. In addition to being a polite form of address in Pāli conversation, it is commonly used as a term of respect for Theravada monks. Henepola Gunaratana was born December 7, 1927 in the small Sri Lankan village of Henepola. He was ordained as a monk at the age of 12, and received his education at Vidyasekhara Pirivena, a monk’s school at Gampaha. He received upasampada when he was 20, in Kandy. Bhante Gunaratana attended higher education in Sri Lanka at Vidyalankara College in Kelaniya and the Buddhist Missionary College (an affiliate of the Maha Bodhi Society) in Colombo. He also served as a religious advisor to the Malaysian Sasana Abhivurdhiwardhana Society, Buddhist Missionary Society, and Buddhist Youth Federation. Following this he served as an educator for Kishon Dial School and Temple Road Girl’s School. He was also the principal of the Buddhist Institute of Kuala Lampur. 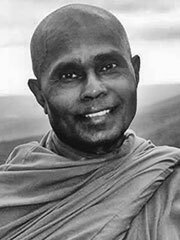 Bhante Gunaratana came to the United States at the invitation of the Sasana Sevaka Society in 1968 in order to serve as the General Secretary of the Buddhist Vihara Society of Washington, D.C. He was elected president of the society twelve years later. While serving in this office, he has conducted meditation retreats and taught courses in Buddhist studies. Since his arrival in the United States, he has expanded his scholarly knowledge by earning a bachelor’s, master’s, and doctorate in philosophy at American University. He has also taught graduate level courses on Buddhism at American University, Georgetown University, Bucknell University, and the University of Maryland, College Park. He also lectures at universities throughout the United States, Europe, and Australia. He is the author of the considerably influential work Mindfulness in Plain English. Bhante Gunaratana is currently the abbot of the Bhavana Society, a monastery and meditation retreat center in West Virginia.